Happy Monday- I spent last week at the beach playing with my family. I can't wait for summer and the warm southern California weather to kick in. 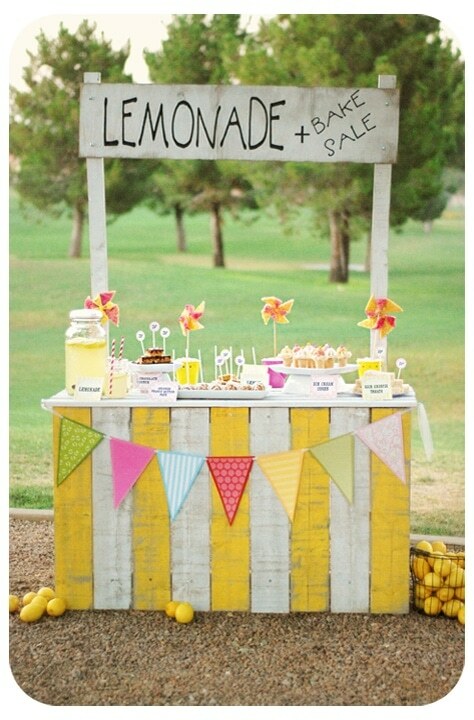 So, it's lemonade week on Bloom and what better way to start things off than with an amazing lemonade stand tutorial. Before you click off thinking that it will take forever, I want you to know that this stand took me less than 2 hours to build. When I was looking for a farm stand for Charlotte's birthday party, I found this adorable photo on Pinterest. It took me to Lil Luna and I've been a fan ever since. I've emailed with the lady behind Lil Luna, Kristyn, a handful of times and she is an incredibly sweet, down to earth, adorable person- a new friend. You will love her blog! 1. I didn't need to antique my stand since that wasn't the look of my party. The crisp hot pink and white worked great. 2. I had all the wood cut at Home Depot when I bought it. They will do this for free. I took in all the measurements with me and they did the real work. When I got home, all I really had to do was paint the boards (with a big roller) and screw the pieces together. This step requires a bit of preplanning and math but it saved me soooooo much time. 3. My stand is obviously longer than Lil Luna's. Decide on the length you want. Adjust the length of the front 2x4s and increase the amount of planks that you need. 4. I did not use glue, or counter sink or make corner brackets- I'm sure Lil Luna's stand will last much longer than mine. I did use drywall screw to attach everything. 6. Like Lil Luna, I had a vinyl decal made for the lettering. You could easily hand paint it but I am much too impatient. Maybe someday. Add the adorable party bunting we made last week:) and let the kids have fun! Now that the Apple of Our Eye Party is over, my kiddos have new plans for the stand. We are repainting and using it for a future project. Concessions anyone? Photos coming soon. See you tomorrow.